The only complete book on the archaeology of 20th-century excavations undertaken at Stonehenge is the volume commissioned from Wessex Archaeology by English Heritage in 1993 and undertaken by Rosamund M .J. CLEAL, K.E. WALKER, and R. MONTAGUE. Published in 1995, it is Stonehenge in its Landscape:Twentieth Century Excavations. (English Heritage Archaeological Report 10, London). ISBN 1-85074-605-2. £60 hardback. The archaeological details are thorough, and the book tightly-written. It is the essential starting point for everyone who truly wishes to learn the fundamentals of what is known about the monument. Indeed, no-one can write seriously about Stonehenge who has not studied and understood this work first. In Wessex the book can be found at several public and museum libraries. Elsewhere it can be traced through specialist university libraries and archaeological society libraries or obtained via the inter-library loans system. What motivated the design plan which led to the nested circles and the U-settings? Why trilithon arches, and why so many? Why a midsummer sunrise alignment? Why is there a focal stone that sparkles in the sunshine but which is illuminated by the sun for only a few minutes annually, at midsummer sunrise? Why were circular rings dug around the Heel Stone and only two of the four Station Stones? What was the most plausible function of the Station Stones? What was the nearby Stonehenge Cursus earthwork built for? Taking into account all the known facts of archaeology, science and ancient religion, the author explains these mysteries in terms of the universally-adored, world-renewal fertility/creation myth called the Sacred Marriage or The Marriage of the Gods; for this inspired the device by which the cosmic fertilisation of a female deity on Earth was achieved by visible revelation --- namely, the midsummer mating of the rising sun (via its radiant light) with a female standing stone (mis-named the Altar Stone at Stonehenge) inside a womb-like setting of stones. This Cult Stone or focal stone, which sparkles in even weak sunlight because of its myriads of tiny mica mirrors, was the object of the cult. It is set at the focus of several circles and U-settings which together specify the Earth Mother's organs of generation. The intention appears to have been to ensure the security and fertility of the people's world by means of a dramatic midsummer spectacle which everyone could witness and understand. In other words, it is proposed that Stonehenge is a womb-shaped temple designed and raised in a spirit of belief and devotion much like the hundreds of thousands of womb-shaped Hindu temples which also house an icon of the divinity set deep in the womb-cell and known to the Hindus as the garbha grha. What is more, at Stonehenge and some other ancient British temples (the cove at Avebury is pre-eminent) the effect initiated by the solar component was completed by the shadow-casting of an additional stone. At Stonehenge this was the Heel Stone, and its phallic shadow followed the sun into the womb, until the shadow, too, fell upon the frontal basal part of the Cult Stone. 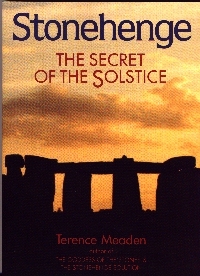 This plausible theory for Stonehenge and Avebury was the subject of a major broadcast on terrestrial TV in 1998 and 1999 (Channel 4, Britain) and Satellite TV (Discovery Channel, Worldwide), and its general principles including the primary Mother Earth concept were well-supported by participating archaeologists of international standing. The Secrets of the Avebury Stones is the most comprehensive book on ancient Avebury ever written --- a valuable book at £12.99 that guides you to every stone. In addition, many neighbouring sites are described in depth, above all West Kennet Long Barrow. The book is unique for its photographs of the dozens of stones that depict human heads---most of them partly carved---which can be seen at Avebury by the inquiring visitor to Avebury. There is also an important chapter with photographs of the huge, newly-discovered, realistic, carved, face on a trilithon at Stonehenge. 2 from Sir Ludovic Kennedy. "As a long-time resident of Avebury I have to say that Dr Terence Meaden's well-illustrated book has been a revelation to me. Previously the stones had never had much to say to me, but now under his guidance I am enabled to see them with re-awakened eyes." "Essential reading for all megalithomaniacs". Terence Meaden's singular unravelling of the mysteries of the Wessex megaliths continues apace. The book includes plenty of excellent photographs which note the time of day and date they were taken to enable budding Avebury head-hunters to locate and examine the megalithic faces for themselves. This tremendously-illustrated book clearly shows that the heads are there. Confirmation of Meaden's radical theory could be pursued by looking for heads of a similar style to those described here at other sites." Neil Mortimer. [Yes. Similar heads have now been reported from over 20 Stone-Age sites]. 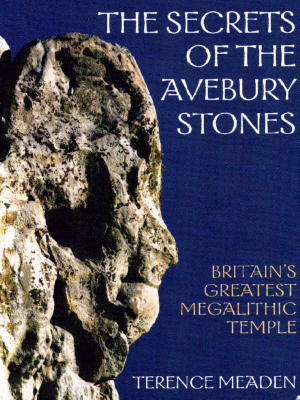 "An agreeable and well illustrated discussion of the megalithic complex at Avebury . . . His investigations culminate in a stone-by-stone examination. The author is to be commended for putting in an enormous amount of fieldwork and producing this visual feast." Mike Haigh. which only comes along every now and then, one which literally takes one's breath away with its content and implications. After providing a detailed introduction to the known history of the monument in the opening two chapters he embarks upon a guided tour round every one of Avebury's standing stones, and gives evidence that some 60 anthropomorphic forms, i.e. human heads and faces, are on display on the megaliths, as well as 40 more on other stones in the surrounding landscape (Kennet Avenue and West Kennet Long Barrow). Ample and persuasive proof of this claim is to be seen in nearly one hundred black-and-white and full colour photographs. Each has the date and time in the caption to enable the evidence to be checked by the visitor. Meaden points to the subtlety of the profiles --- unseen 'spirits' --- many of which are visible from only one direction. Usually there is a well-formed, prominent nose and mouth, and always there is an eye. He informs us that at the henge over 50 of the perceived heads are left-facing as opposed to only 9 right-facing ones; and argues that this proves the authenticity of the forms because a chance, random selection of faces would have given a 50-50 split of left- and right-facing heads. In fact, Terence Meaden provides convincing evidence that some of Avebury's stones were fashioned by human effort, a concept undeveloped previously. carved face on the side of a trilithon there. his work is methodical and thorough as he demonstrates that sunlight is such a vital component for many of the sculptures. Moreover, the principal heads found inside West Kennet Long Barrow are incontestably the result of carving, for these stones have never been subject to weathering. Symbology was certainly, it appears, a concept that was echoed all around the ancient world, from the Americas to Egypt and India. The Levant, Mesopotamia, India and China, the book is a scholarly study of the development in these regions, commencing before the start of the Neolithic Age, of civilisation and the state or city-states. It is a model of good writing and expert analysis from an author who has specialised in the prehistory of Mesopotamia and the Near East since his Edinburgh doctorate in 1984. I was particularly pleased to see the Indus Valley civilisation included and China as well -- and a further chapter on Japan would have been welcome too. The opening chapter which sets the scene is excellent but as the periods under study are partly contemporary with Western Europe's megalithic/Neolithic period I would have liked readers to be reminded of this from time to time. The concept that all early societies pass through the sequence of 'band' to 'tribe or clan' and 'chiefdom' before arriving at a civilised state is here justly challenged. Dr Maisels shows that complex societies can evolve without social classes and the state, and effectively proves it with regard to the Indus Civilisation. At the end of each chapter Dr Maisels has usefully employed Gordon Childe's 10-point criteria (here reorganised as 12) for deciding upon the arrival of the Urban Revolution. He himself recommends (p 25) the reader, towards the end of the opening chapter, to jump to the final one (p 342 et seq) to absorb the contents of the summary of the checklist given there before embarking on the intervening chapters which treat the various areas. This is a fine book for general reading by anyone interested in archaeology, and considered very useful for undergraduates. Published by Routledge, 11 New Fetter Lane, London, EC4P 4EE, and 29 West 35th Street, New York, NY 10001. £40.00 h/b. 479pp. 1999. ELLIS, Linda (ed). Archaeological method and theory: an encyclopedia. UKP140.00, Garland, October 1999. ISBN 0815313055. WAKEFIELD, J.J. ... August 1999. Nod Press, Marlborough, Wiltshire, UK.